In the transportation ecosystem, online marketplaces have gained eminence. A major reason being participation of buyers and suppliers due to competitive price of transportation, improved access by customers and scope of exploring new markets for suppliers, transporters or brokers. The Logistics Marketplace provides freight owners, transporters and clients the convenience of connecting in a short time. An online marketplace has simplified the transportation process across the length and breadth of the country. Often the trucks are partially or fully empty within the delivery routes. A marketplace can end this problem. Truck owners or transport owners can post their details on the marketplace. The customer or consignment owner can also post their requirement on the online platform and transporters can place their bids based on it. Using the empty or unused space Eensures optimum utilization of resources and will also be an overall reduction in the carbon dioxide emission which has a positive effect on the environment. To stay competitive in this emerging ecosystem, it is important for transporters be a part of the Logistics Marketplace. Engaging the customers, transporters, fleet owners and brokers on a single online platform improves networking. This online platform is an important tool for transportation companies and truck-owners to explore new opportunities. Owing to the mechanism of these marketplaces, the movement of freights, bidding and booking of vehicles will always be smooth and systematic. It is an integrated approach- buyers or shipment owners, multiple suppliers or truck-owners, and transporters can get real-time information about the freight movement and status of shipment delivery. The real-time inputs help them in strategizing their business accordingly. This marketplace is perfect for transporting industrial and commercial goods, eCommerce consignments and household items. In short, it is an effective way of reaping high benefits. Already this business model is successful in twenty countries across the world. Now the question lies what has led to the rise in the participation in Logistics Marketplace! In the traditional method of freight booking, transporters usually do not have the information regarding the availability of trucks and quotation of services. They do not have the power of laying down their own terms and conditions of business owing to the nature of prevailing market and due to the presence of middlemen in the booking mechanism. Thus, accepting the quotation provided by brokers is often the only way out. As a result, the consignment owners have to pay high freight rates which often includes the cost of an empty truck returning home. The electronic marketplace has put an end to all these hassles. The online Marketplace, lets transporters stay abreast of the real-time information about the freight movements. Tracking features and facilities help in knowing the movement of vehicles from the source to the destination, thus reducing the chances and scope of malpractices like rerouting, pilferage and overloading. Another advantage is that consignment owners can opt for the trucks or vehicles that suits their budget. The option of bidding for a vehicle, makes it profitable and affordable for the truck-owners and shippers respectively. Since it is a horizontal collaborative effort between vehicle owners and shippers, the chance of exploring new opportunities increases exponentially. The pre-defined contracts define the rate and important terms and ensure a predictable environment for operations. The role and responsibility of each stakeholder are clearly explained in these contracts. You can expect improved level of communication and operational efficiency owing to the automated and simplified flow of information. The logistics marketplaces yield benefits for all the partners- transporters, fleet or truck owners, customers and brokers. Transporters– They can get better visibility and real-time insight about the consignments, irrespective of the nature of the vehicle and shipment. You can expect reliable delivery, better management and superior customer service. Fleet or truck owners– Better vehicle and fleet utilization through proper scheduling and real-time visibility is now possible. 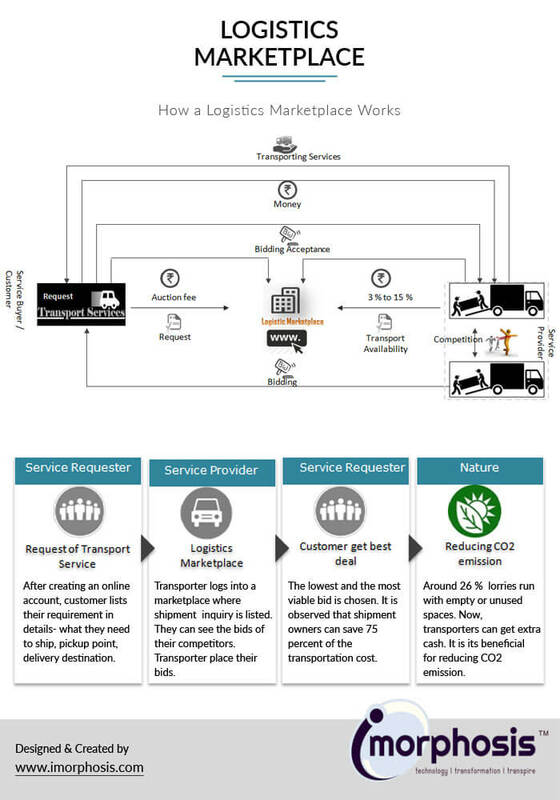 Infrastructure and unique methodology of this marketplace let even small-time carriers compete with the large companies. Customers– Customers or the shipment owner will have now better control over the process. They can track the vehicles easily and stay within their budget. Brokers– A transportation broker does not own a fleet, transportation company or a carrier, but have a significant role in cargo movement. A logistics marketplace helps them to explore new areas of business. Apart from the above mentioned four partners another important member is Insurance Provider. Efficiency, speed and simplicity are three major reasons for the transporters, truck-owners and customers participate in these online logistics marketplace. With the rise in on-demand delivery services, there has also been an increased expectation of a supply chain that is agile, organized and transparent. A Logistics Marketplace lives up to that expectation. Here, you can choose the best transporter based on your requirement and budget. Since no third-party is involved in the process, you do not have to pay any commission fee or additional fee. Planning– This phase deals with the customers who are on the look out of a truck or lorry. Bidding– Transporters can place a bid based on inquiry posted by the end-user or consignment owner and the bidding ends as per the discretion of the latter. Communication– Direct communication between transport owners and customers is possible on this platform which is not possible on traditional form of freight booking. Predefined contracts and documents emphasize on transparency and improving efficiency. Tracking– Transporters and customers can track the movement of shipment after dispatch and get real-time insights. Invoicing– Relevant data are available in a centralized dashboard. Automated invoicing process makes the process smooth. The marketplace is an effective platform that facilitates the process of hiring trucks and speeds the transportation process. Use of latest technology in the development process and cloud logistics solutions have made these platforms effective. Different features and functionality of this marketplace, provide visibility and ensure transparency. Thus, it is an ultimate solution for choosing the best transporter at a cost-effective price and yield high ROI. You can see top 10 funded logistics startups in India the year 2015-2016. To make the transportation process easy, iMorphosis now develops intuitive logistics marketplace where the shipment owners can post an inquiry, transporters and fleet owners place a bid on it and choose the best transporter. iMorphosis uses Agile methodologies and the Scrum framework for the development of this online marketplace. Contact Us Now for immediate solution.